Happy Quilting: The Simply Charmed Blog Hop starts at Happy Quilting and the Grand Prize Giveaway!!!! The Simply Charmed Blog Hop starts at Happy Quilting and the Grand Prize Giveaway!!!! Welcome to the kick off of the Simply Charmed Blog Hop!!!! So glad you will be joining us for what is sure to be a lot of fun. In the next 2 weeks you will get to hop to 10 different Valentines tutorials all using a single charm pack. You can find all of the Hop Stops here and they will be updated daily with the links to each of the tutorials. And don't forget to enter the giveaway at the end of each tutorial. Including the $200 Grand Prize Gift Certificate to Fat Quarter Shop at the end of this tutorial!!!! I mean, who doesn't want to win some awesome fabric cash??? Speaking of Fabric Cash, I want to send out a huge THANK YOU to Kimberly and Fat Quarter Shop, Leah and Burgundy Buttons, Julie and The Intrepid Thread, and Judi and Green Fairy Quilts. This blog hop would not be near as fun without your wonderful generosity and support. Thank You!!! So let's get to it!!!!! I am so happy to share with you this first tutorial for a super cute Valentines project that I like to call . . .
Now select 10 sets of 2. Take two sets of 2 and place them with right sides together, lining up the raw edges of your seam side. Now sew a 1/4" seam along the edge. (Once again, I didn't use pins). Continue chain stitching until you have made 5 sets of 4. Clip your threads and you can still wait to press. Now select 4 sets of 4 and 4 sets of 2. Take a set of 2 and place it onto the set of 4 with right sides together, lining up the raw edges of your seam side. Sew a 1/4" seam along the edge. Continue chain stitching until you have made 4 sets of 6. Clip your threads and your almost ready to press. Now to sew all of the rows together. Lay Row 1 onto Row 2 with right sides together taking care to match the center seams. Pin the nested seam and the 2 side seams. Sew a 1/4" seam starting and finishing at the raw edges of row 1. Lay Row 3 onto Row 4 with right sides together nesting and pinning the seams and do the same for Row 5 and 6. Sew a 1/4" seam along both pinned sets of rows. Press your 3 seams. Now simply repeat the process sewing your now sewn together Row 1 and 2 onto your now sewn together Row 3 and 4. Once again, you will be starting and finishing the sewing at the raw edges of the Row 2 piece. Lastly, Sew the 4 rows onto the remaining Row 5 and 6. Press your seams. And Wha La!!! You have the basis of your apron. Now to give it a little curve :) Fold your apron in half with wrong sides together. Draw a gentle curve across the last block in the second row. Cut along the curve through both layers of fabric. Now you can set your apron top aside for a bit as we move onto the lining. From your 20" lining piece cut a 15" section off of the top. Now you have 2 pieces. One 15 x 20 and one 27ish x 20. You knew I couldn't do a project without having some quilting in it. So, to add a little strength and mostly a little decoration we are going to quilt this apron, but with no batting :) To do this, lay your pieced apron top onto your back lining piece with wrong sides together. The lining will be larger than the apron top :) Now baste the 2 pieces by pinning (I just used straight pins for speed sake) your apron top to your lining every few inches. If you have never done binding before see this tutorial for more details. It will really help :) Start by cutting your binding fabric into three 2 1/2" x WOF strips. Sew these three strips into your binding strip and press it in half. Attach your binding strip to the back of your apron first aligning the raw edges of the binding strip and the raw edges of your apron. Go ahead and miter the corners like you would a quilt and then on the curves just gently try to keep the raw edges together adding a little slack where necessary to keep it lined up. Add the binding strip around the entire apron and then sew the 2 ends of the binding strip together. Take your remaining 12 charms and sew them into one row. (You can use the same chain stitching sets of 2 methods that we did at the beginning to save some time :) Press your seams. Now, fold your strip over so that right sides are together and the raw edges line up. Sew a 1/4" seam along the raw edge of the entire strip. Press. Now you are ready to cut a neck tie and 2 waist ties. I cut my 3 pieces at the following dimensions. But I like my neckline high and a big bow in the back. So if you prefer a longer neck line cut it a little larger and the waist ties smaller. Now is the fun part where we get to make this apron a little knotty :) Using your grommet kit and the instructions with it, insert a grommet into the 4 locations shown. And all of the sudden, you are finished and have a super cute Knotty Little Apron!!!! I hope you have a ton of fun making your Knotty Little Apron either for yourself or for someone special. If you have any questions on this tutorial please do not hesitate to email me at happyquiltingmelissa (at) gmail (dot) com. And when you are all done I would love it if you added your pictures of your fabulous Knotty Little Apron to our Simply Charmed Blog Hop Flickr Group and my Happy Quilting Tutorials Group. 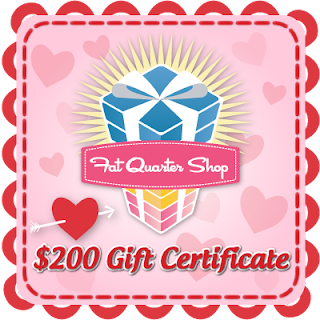 Fat Quarter Shop has graciously sponsored our Grand Prize Giveaway of a $200.00 gift certificate!!!!! Do you know how much fabric you can buy with that??? Oh, I get giddy just thinking about it!! So to enter to win this totally amazing Grand Prize, simply leave a comment telling me your favorite love song. For one extra entry, become or already be a follower of Happy Quilting and leave a comment saying so. And that's it :) International entries welcome and please leave an email address if you are a no-reply blogger :) The Grand Prize winner will be announced on Valentines Day!!! Wow, 200$ is a lot! My favourite love song is "Ship song" by Nick Cave. It is the sound track of my lovestory with my husband. My fave love song "A totally Eclipse of the heart"
Hmm gotta be really sickly here and say Oceans Apart by Richard Marx! Thx for chance! Cute apron! I am a follower. My favourite lovesong is Songbird by Fleetwood Mac. I love the apron! My favorite love song is "Best of My Love", The Eagles. Very nice giveaway!! Thank you. My favorite Love Song is Stuck On You by Lionel Ritchie. I'm a follower too! Maybe there is a way to put pockets on that apron? Hmmmmmm!! I remember making an apron in Jr High School and it had big pockets across the bottom of it. I cant wait to make this after work. But I cant do grommets. They never work for me so I think I will pillow case turn and sew in the ties to the seams. Grommets just don't like me. My favorite love-song is "Kvinde-min" with Gasolin (a Danish band that doesn't excist anylonger). Very beautiful apron, I am a follower. How Great Thou Art....my favorite love song! "La vie en rose" is my favorite love song. My favorite love song is by Stevie Wonder, I just called to say I love you. My hubby calls me at work, and when I answer, he starts singing this song to me. I am already subcribed to Happy Quilting. Do you know something? I haven't really got a favourite love song, but if I had to choose a really soppy gooey one I suppose it would be Without You. BTW I love the heart fabric and I'm now following you. Thanks for the chance. My favorite love song is "Hero" by Enrique Iglesias. Love it. I'm a follower :) And ps -- that apron is really cute! Super cute! I will definitely be making this...maybe for St. Patrick's Day! :) Favorite love song? Maybe "At Last" by Etta James? Or anything sad/sappy/lovey from Ray Charles! And I'm a follower!! Woohoo! I am already a follower - and thank you for a cute tutorial. I am a Happy follower already. Thank you so much for this fun blog hop! My most favorite love song of all times is At Last by Etta James. Great tutorial! My favorite love song is "You're the reason God made Oklahoma"
My favorite love song is George Strait's, "I Cross My Heart." It also happens to be the song my husband and I danced to at our wedding. Favorite love song? Ummm, not really into love songs, but it would have to be Endlessly, by Muse. My favorite is Sometimes when we touch by Dan Hill! Like your apron! Great way to use Charm Packs! Thanks for the great blog hop and this GREAT giveaway! Thanks for the great blog hop and great little apron pattern! My favorite song is "Time in a Bottle" by Jim Croce. We wanted to play it at our wedding, but my MIL thought it was talking about booze and wouldn't let us! Love the apron! Fav love song is "Can't Help Falling In Love" by Elvis Presley. Cute apron - it's refreshing to see a pattern that doesn't require masses of charm packs to complete! My favorite love song is "I Only Have Eyes For You" - any version but I'm partial to Art Garfunkel's. Hearing "At Last" by Etta James always makes me swoon :-) Well, not actually, but it really grabs me every time. I'm not much of a hearts kind of gal, but I do need a new apron, so thank you for the tute! Cute! The Rose by Bette Midler. Hmm, I am dating myself! Oh yes, you were the first blog I ever followed! More Than Words by Extreme. I love that apron - it is too cute! My favourite love song is Love is all Around from Three Weddings and a Funeral. Thanks for the apron pattern. Cute apron! I won't have much time for Valentine's projects this year, but am looking forward to seeing what's in store that I can come back to later :) Thanks for the blog hop! My favourite love song is I Will Be There by Steven Curtis Chapman. Love, love, love it. One of my favorite love song is Lost in Love by Air Supply, how corny is that. I am a follower already and visit often. thanks for the apron tutorial. I'm not really into love songs, but there is a song about love that I either love or hate, since it can make me cry. It's an oldie, Harry Chapin's "Cats in the Cradle" about a father's love for his son and missing much of his son's childhood. Don't think too much about the lyrics or they will make you sad -- or do, because there's a lesson in them. My favorite love song is Alison Kraus's "When you say nothing at all". Thanks for the apron tutorial - it looks like a great quick project! One of my favorite love songs is Al Green's 'Let's Stay Together'. Very exciting hop! My favorite love song is "The Very Thought of You" by Johnny Hartman. I'm old, what can I say?!?! I love the OLD songs! "It Had to be You" is my favorite love song. We danced to Harry Connick Jr.'s version at our wedding. Very cute project! Love that it uses all the charms in one pack with only lining fabric needed. My favorite love song would be "let's fall in love" by Diana Krall. I am a follower of your blog. I am drooling with the possibilities! i have been a follower for a long time. Thanks for the great giveaway. Favorite love song, hmm. Well, having a lot of kiddos, I would say, "Jesus loves me" is my favorite. Maybe not a true love song but my husband and I have a favorite song. Remember When by Alan Jackson. We danced to this at one of our son's wedding and it just seems to fit our relationship perfectly. Thanks for the great giveaway. I am a follower...thanks for this. My favorite love song is "breath" by faith hill... im not much of a country lover, but this song always makes me sit still. I am a follower here and facebook! Love your blog!!! My fav song is I could not ask for more by Sara Evans , I am a follower! I love this apron! Looks like a fun project to do with my grandaughters! Thank you for the giveaway too, my favorite song is "I Do". Unforgettable by Nat King Cole! My fav love song varies, but lately I'd have to say Stuck like Glue by Sugarland. Just writing this has gotten it stuck in my head! I'm a follower, too. That apron design would lend itself well to a "manly" charm pack, too! Cute apron! I'm your follower. I'm a follower and I just love your blog! Cute apron too, so easy! It may be corny, but my favorite love song is "You are the Sunshine of My Life"
That's just what I need, a simple-to-make apron that covers up my top half, since that's where I seem to spill things the most. I forgot to say, my favourite love song is You Always Hurt the One You Love, as it's what my DH and I sing to each other if either of us upsets the other a bit! I've just joined you as a Follower. Love the apron! My favourite love song is Independent Love Song by Scarlett O'. I am a follower through Google Reader. Fab apron. Fave love song...Thunder Road, B. Springsteen. Love this apron, would look great on my nieces! My all time favorite Unforgettable by Nat King Cole! I'm so excited for this blog hop! Yeah! It's finally February 1st! My favorite love song for my child is The Moment I Saw You by Lullabies Forever. Can't wait to read the rest of the blogs! My favorite love song is "Hey good lookin', what you got cookin'" because my dh lets me sing it to him. LOL! OMG - What a fantantic blog hop. Yes I am quite the follower. I enjoy your blog so much and all of your creative ideas and all the fun that we all have and share. At the time I was dating a bartender and was so in love with him, Exile had a song called "Kiss you all over". That was our song and always will be. He moved to LA for a better job and I stayed here in Sonora, CA. I will always love him and will never forget this song. It holds a special place in my heart. If you have never heard of Exile, you need to hear this song one time and then you will fall in love. Thank you for such a prize. Any quilter would cherish such a giveway. Yes I definitely would be quilting my little heart away. And why not? This is going to be an excellent blog hop~! Very cute apron, thanks. My favorite love song is Candy sung by Big Maybelle. My favorite love song is "Brown Eyed Girl" because this is the song my husband would sing to me when we were dating. Been married 42 years this year! I am a follower here. Thanks for the giveaway chance! My favorite love song is about God's love and is called "The Love of God." I love the apron and have a charm pack ready and waiting. Thank you for the tutorial - LOVE it! My favorite love song is Color My World by Chicago. My favorite love song is "Still Loving You" by Scorpions. Thanks for the free pattern and chance for the giveaway! Elton John's Love Song is my favorite (how original - LOL). The apron is adorable! My favorite love song is "Keeper of the Stars" by Tracy Bryd. Such a darling apron!! Since I don't listen much to music, I asked my daughter. She came up with Love Story by Taylor Swift. Thanks for the giveaway. Darling apron! My favorite sone would be Johnny Mathis' Twelth of Never!!!! Cute apron! I'm looking forward to seeing what everyone else comes up with too. What a fantastic giveaway!! My favorite love song is Fields of Gold by Sting. Somewhere My Love is my favorite love song. Thanks to FQS and yourself. I am a follower and have been for a long time. Wow! Fabulous apron! My favorite love song is Listen to your Heart by Roxette. Love the 80's! I am a happy follower of your blog - I'm so excited about your Charm focus!!! My favorite love song is "Always" by Bon Jovi. Always in my heart! And oh yes, I'm a follower! I am going to pick a non-traditional favorite Love Song - because it is about a place, not a person. I love "Carolina (I Remember You)" by Charlie Daniels. Oh, it makes me miss home so much!!! I did hear it for the first time on my first date with my future husband - thirty-one years ago yesterday!! That's pretty lovey!! One of my favourite love songs is Bryan Adams' "Everything I Do, I Do it for You". I love the apron. My husband and I both love Anne Murray's "Could I Have This Dance". We like singing it as a karaoke duet. Thanks to you and the Fat Quarter Shop for the give away. I LOVE this...and it's a chance to use my grommet kit. My favorite love song is 'A Crazy Little Thing called Love' by Queen...and yes, I'm dating myself! Thanx for the chance! My favorite love song is "At Last." Favorite song "Truly Madly" by savage garden. Everything by Michael Buble, love that song! Cute apron! I follow you! Such a cute apron! I'm a follower. Well I had plenty of time to think about a love song scrolling down all the entries...sheesh a lot of people like the FQS LOL. The Power of Love sung by Celine Dion...love it!! My favorite love song has always been Our Love is Here to Stay, as sung by Frank Sinatra. Hubby and I danced to this at our wedding and it always makes me remember our first dance when I hear it. My favorite love song is the song "Firefly" by Jimmy Needham. Cute cute apron! My favorite love song is You are the Sunshine of My Life. Sorry forgot to mention my love song. It is ;And I will always love you. The apron is really lovely! Thanks so much! My fav love song is my wedding song which is Can I have this Dance. Thanks for the great tutorial and giveaway. thanks to the sponsers! I am a follower! thanks again! My favorite has to be my Honeyman and My song (which I have tattoed all up my right arm) Faithfully by Journey!! I am a follower!! Thank you for sharing the great pattern!! Favorite love son? Oh, this is tough. I'm torn between the old Erroll Garner's "Misty" and Nat King Cole's famous "Unforgettable." Love those. Great tutorial! I am a follower of course! Could I have this dance is my favorite love song, great giveaway! I am now a follower. Thanks for a great giveaway!